Frank E. Funk (1923-2015), former dean of University College, died on Friday, Aug. 21. He was 92. Funk’s career began at Syracuse University in 1943 as a young recruit for the war effort. A World War II veteran, educator and administrator, he was also an active community volunteer. During World War II, he was a navigator with the 463rd Bomb Group of the 15th Air Corps. He was captured by the Germans when his plane went down over Czechoslovakia and was a POW for the remainder of the war. After the war, he attended Syracuse University on the G.I. Bill and received his B.S. and M.S. in speech communication. He obtained his Ph.D. in business communications from Purdue University, and became an assistant professor of speech. He taught at Purdue and Lehigh universities before returning to Syracuse University, where he served as a faculty member and administrator for 32 years. 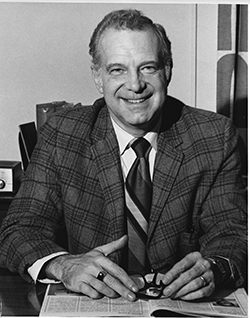 Funk became assistant dean of University College in 1965 and dean in 1970. During his tenure, University College experienced significant enrollment growth through the development of five new formats for degree-granting programs, five new certificate programs and dozens of non-degree courses, television courses and video courses. During his tenure, Funk also served as director of continuing education and as national president of the Association for Continuing Higher Education. He is survived by his daughter, Karen Funk Blocher (husband John), his stepdaughters Janet Johnson (husband James Tremblay) and Amy Sisley, sister Marie, and nieces and nephews. He was preceded in death by his wife, Ruth Christy Funk, his son Steven and sisters Hazel, Doris and Grace. A memorial service will be held at First Presbyterian Church, Wilmington, on Tuesday Sept. 1, at 11 a.m. In lieu of flowers, donations may be made to First Presbyterian Church, the Wilmington Symphony or the Wilmington Railroad Museum. The Syracuse University flag will be lowered to half-mast from Monday, Aug. 31 to Wednesday, Sept. 2 in honor of Funk’s long and distinguished service to SU.